Adam proposed to Katie on a tiny beach on the north side of Orcas Island, the place they go for Katie’s birthday every year. They love spending a weekend enjoying island time and exploring the little town of Eastsound. Their wedding is scheduled for this Saturday, just around the corner! When discussing engagement photos, they wanted to make sure to take some photos by the water. 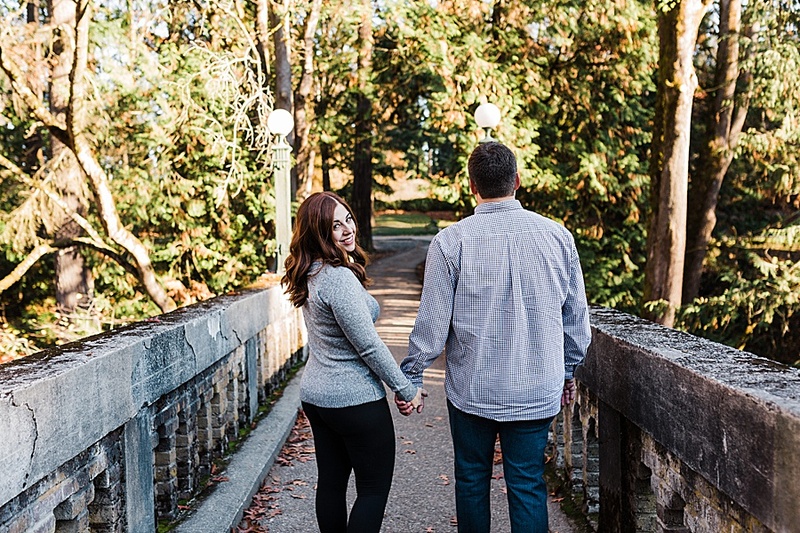 They opted for an Adventure Engagement Session all around Seattle! We spent a sunny fall Saturday visiting some of their favorite parks around the city. We started at the Washington Arboretum, capturing views of Husky Stadium (Adam was in the Husky Marching Band!) and all of the pretty fall leaves. We then headed over to the Ballard Locks with more of an urban vibe. The locks are always fun to visit at any time of year and Katie’s sparkly dress really set the tone for that part of the session! We finished off the evening at a few locations at Discovery Park. They brought along their pup for a few photos and we ended the session down by the lighthouse. The sunset lit up Mt. Rainier with a beautiful alpenglow, making for an absolutely stunning scene. I’m so stoked to capture their wedding this weekend at Melrose Market on Capitol Hill. It’s sure to be a good one!